Before we talk about the best car undercoating sprays, let’s tackle the root of the problem in the first place: rust. Rust will literally eat away metal. If you can imagine the undercarriage of an old car, you would probably find a lot of rust formation. 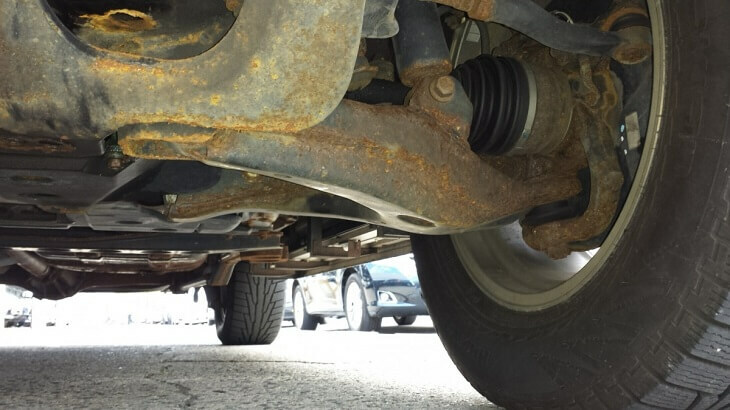 If left unchecked, rust will consume the entire undercarriage, and this affect the overall integrity of your vehicle. 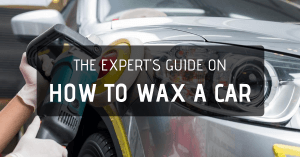 In fact, even the smallest presence of rust on the underbody is something that you should be concerned about, especially if you drive a newer car. New cars are treated with a coat of rust proofing at the factory, so you should be worried if you see rust on your 4-year old SUV. If you live in places like Hawaii or South Dakota, then you should definitely pay attention because it doesn’t matter if your car is brand new or just a silly old rust bucket. 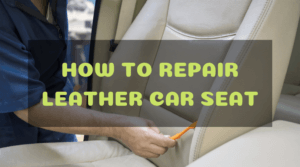 Salt and corrosion go hand in hand, and if you live near the sea or if you drive your car in harsh weather then rust formation is inevitable. It’s like death and taxes. They will come, but nobody knows when. It’s as sure as the sun rising in the East. Well, you get the picture. That’s the main problem with rust. You wouldn’t notice that they’re already there, eating away at the precious metal of your ride. Rust moves fast, too. Even just a slight dent on the undercarriage can cause rust to form in a matter of hours. However, all is not lost. You can either depend on the services of a professional, or you can do it yourself. But there’s a problem. Professional undercoating services will usually cost hundreds of dollars, and you will have to wait a day or two for the job to get done. 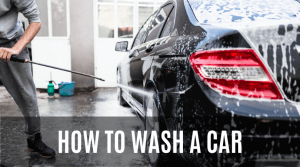 Professionals will place your car on a hoist, remove all the wheels, spray the undercarriage with pressurized water, degrease the entire floor pan, and let it dry before applying the undercoating. But if money is tight, then why not do it yourself? You will thank yourself in the end, because you are protecting the value of your investment while improving the NVH of your ride. That’s right. Undercoating will seal all the nooks and crannies of the undercarriage, thereby preventing road noise from intruding inside the cabin. Not a bad deal in exchange for a couple of hours of work on a lazy weekend, right? The no-run formula makes the product easier to apply, since you don’t need to worry about cleaning drips on your garage floor. The 3M Rubberized Undercoating spray will protect your vehicle undercarriage from rust, corrosion, and abrasion caused by salt, rain, stones, dents, and dings. The rubberized coating provides durable protection and sound deadening properties by sealing small cracks, holes, and undulations of an old undercarriage. 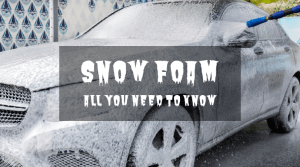 The rubberized spray will create a protective barrier to seal out grit, moisture, and grime, the three elements that cause rust and corrosion on all metal components. You can easily protect metal surfaces from rust and corrosion by using the Rust-Oleum Undercoating spray. 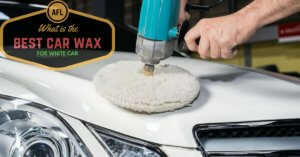 The trusted formula of this rubberized spray will provide a durable barrier against rust formation on the undercarriage. This product is made in the USA to ensure quality and ease of use. The rubberized coat will remain soft when dry, and the surface can be prepped for the application of paint whenever applicable. For maximum protection against rust and corrosion, Rust-Oleum recommends 2 thin coats for every application. Drying time will usually take 1 to 2 hours depending on ambient temperature. The Bondo 737 is an asphalt-based product. This means that the surface is non paintable when dry. But this is not necessarily an issue is you’re going to use this on your undercarriage anyway, unless you’re planning to paint the undercarriage. All it takes is a single coat of Bondo 737 undercoating to protect the underside of your vehicle from rust, corrosion, and metal damage caused by road debris. The formula is guaranteed not to drip, sag, or run. Simply spray for an even coat. The rubberized texture of this undercoating spray will also seal the undercarriage so your car will ride smoother and quieter, even on dreaded cobblestone roads and surfaces with loose gravel. The CRC Rubberized Spray Undercoating is a bubble-free formula designed to protect the undercarriage and diminish outside noise. The formula is designed not to peel or crack even after many years of exposure to harmful road elements such as salt, moisture, and harmful road debris. This undercoating spray goes on thin, but you only need a single coat of CRC to experience a vast improvement in silencing road noise and tire roar. 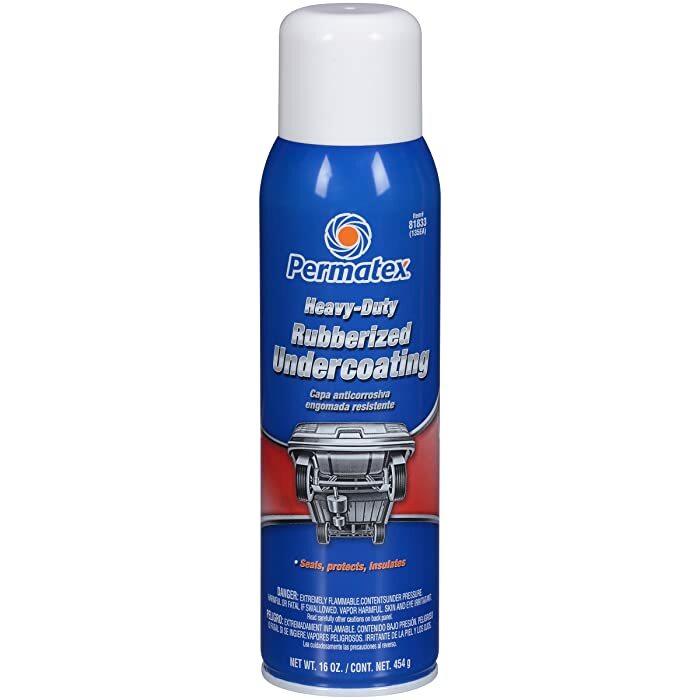 The Permatex Heavy Duty Undercoating spray is all an all-purpose product that seals, protects, and insulates the underbody of your vehicle. The professional-blend formula is ideal for automotive, home, or shop use. You can use this product to seal gutters, roofs, and drainage systems. This is perfect for the DIY enthusiast! The improved rubberized formula will resist moisture and rust, protect the underbody from damage, and improve the NVH characteristics of your car, truck, or SUV. 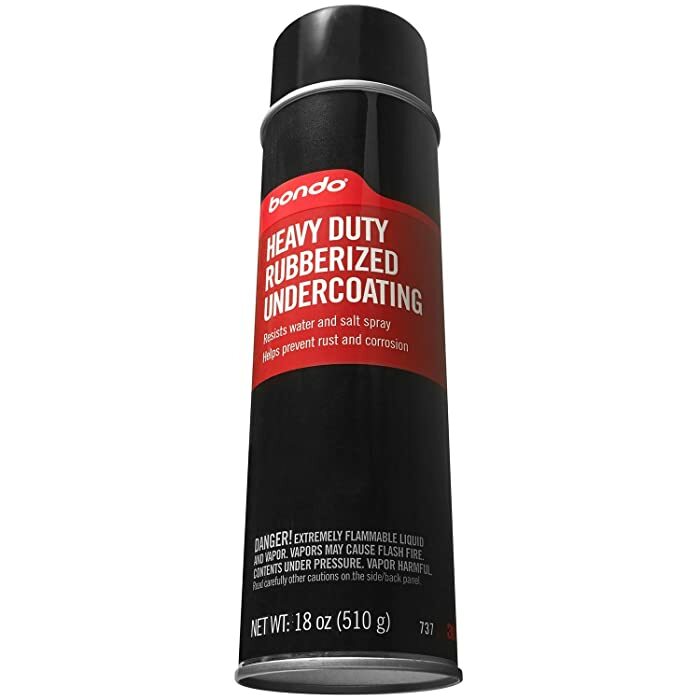 The Penray Rubberized Undercoat is a quick-drying black and rubberized formula that provides a waterproof coating. This undercoating spray will protect against rust, extreme heat and cold, corrosion, fumes, dust, and road salt. The Penray undercoating spray also provides a paintable surface when dry. This product is perfect for the undercarriage, frame, and wheel wells of your car. The rubberized spray also acts as an insulator to reduce road noise. The Penray rubberized Undercoat is designed to rust-proof, seal, and protect all metal surfaces. This product is also ideal for DIY projects on both inside and outside the home. The Plastikote Black Rubberized undercoating spray is an easy to use and easy to apply product that provides protection against moisture, rust, and corrosion. This underbody spray is easy to apply. 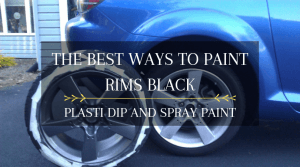 Perfectly designed to coat the wheel wells, weld joints, gas tank, doors, floor pans, and quarter panels of your vehicle to resist moisture and the formation of rust. The rubberized coating provides a flexible and durable barrier that dries quickly. No drips, no mess, and no fuss. 1. You need to clean the undercarriage before using an underbody protective spray. 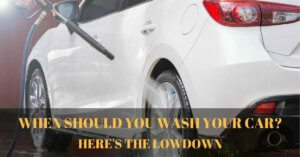 Use a pressurized washer to remove dirt, mud, dust, and other debris. 2. If there is a lot of grease on the surface, you need to use a degreaser before applying underbody spray. 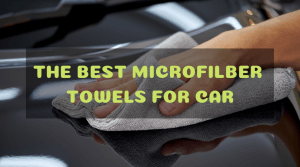 If not, the product will not stick to the surface properly, no matter how long you leave it to dry. 3. If there is a lot of rust on the metal surface, take time to remove rust and corrosion before applying undercoating spray. 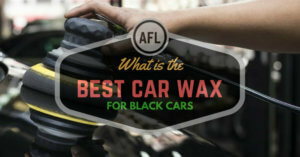 If not, the rubberized formula might do more harm than good, as it will seal the moisture into the metal, effectively increasing the chances of rust formation. You want to keep the moisture away, not trapping it in the metal. All of these 7 products are the best undercoating sprays for DIY applications. However, the 3M 03584 Professional Grade Rubberized Undercoating stands out from the rest. We like the fact that the 3M Rubberized Undercoating only requires a single coat to provide maximum rust protection and sound-deadening capabilities. We also like the price as the 3M Undercoating is in the middle of the price range. Thinking about preserving the value of your car? 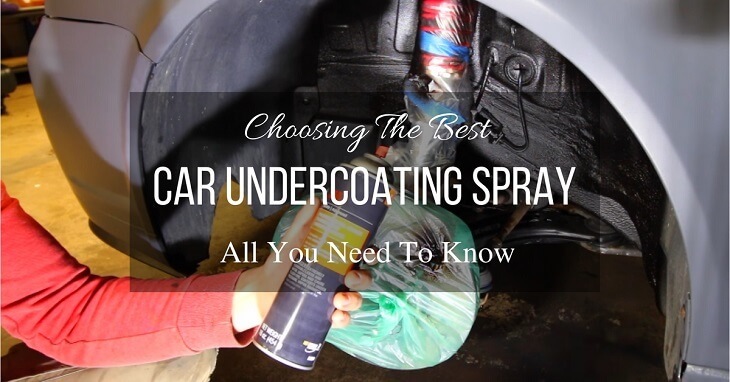 Some people take care of the paint and the interior, but those who really know cars will also take the time to protect the undercarriage using the best car undercoating sprays.